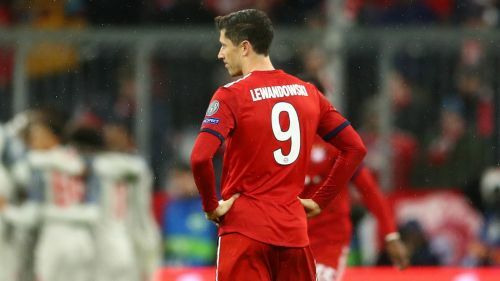 Robert Lewandowski felt Bayern Munich did not try to attack enough as the German giants were knocked out of the Champions League by Liverpool. After a goalless draw at Anfield in February, Bundesliga champions Bayern crashed out on home soil following a 3-1 second-leg defeat to last season's runners-up Liverpool on Wednesday. A Joel Matip own goal six minutes before half-time put Bayern back on level terms following Sadio Mane's 26th-minute opener at Allianz Arena. However, Bayern succumbed to Mane's second goal after Virgil van Dijk's towering header as the Bavarians bowed out in the last 16 - their earliest exit since the 2010-11 season - much to the frustration of Lewandowski. "We didn't play so offensive, and that is why Liverpool couldn't play and score a goal in the first game," Lewandowski said via beIN SPORTS. "We didn't make the risk, to play forward and try to score the goal. Today was also [the same] I think, we didn't try to play offensive, [play] forward and try to score the goals because we didn't have a lot of chances. I think that was our problem. "I knew if we were playing too defensive it would be tough. We were playing at home but that wasn't our game today. That's why Liverpool beat us. "Of course, we have to push again forward. We have the Bundesliga, a lot of games also in the cup. We're still on this way to win, maybe in the Bundesliga, that's why you have to push forward. "Okay, I'm annoyed with what's happened today. I'm not happy, I'm angry because we know what we should do better but we didn't [do it]."